Correction to something I wrote in an earlier post: Bridge players in town for the national tournament this week don’t get free trolley rides if they show the driver their convention cards. I saw that there were supposedly free rides on a popular forum where bridge is discussed and assumed the information was reliable. Today’s official tournament publication states that is not the case; trolley rides are $1 cash. I apologize for any confusion over this matter. One thing I have confirmed from an official source is that they are offering free tours of St. Jude Children’s Research Hospital to bridge players. This is an amazing facility and I would encourage anyone who has the free time to take advantage of this opportunity. I had a question come up this weekend and wanted to address it. “Paul, you blogged about two events coming up: Memphis Adult Sports League and Bar Olympics. They seem to include some of the same bar sports, like beer pong and flip cup. What’s the difference, and how do I figure out which is a better fit for me?” Excellent question. Here’s a summary. Since the league started this past weekend, it’s probably too late to sign up. Hopefully this’ll be a smashing success and they’ll do a fall league. Bar Olympics, Hi-Tone Cafe in Crosstown, 412 N. Cleveland, Sunday, June 23. Events are more geared toward traditional bar games, but the cool thing is, they also have Wii games in the mix! Potential games also include quarters, team beer chug, mini basketball, Connect Four, and more. Finals between the top two teams will be Hungry Hungry Hippo. Complete list at the link below. Point is, they are going above and beyond the same ol’, same ol’ in their selection of games. You have to form your own team and sign up. Registration site is www.thebarolympics.com. The good thing is, there are no restrictions on who can participate/be on what team by ZIP code. You want to enter a team with two from the U of M area, one from Keswick-Stornaway, one from South Memphis, and two from Olive Branch, go for it! Charity event benefiting ALIVE! Rescue Memphis. Just think about it – a dog’s life could be saved because you and your friends like to bounce an engraving of a president into a shot glass. Both the Adult Sports League and the Bar Olympics are about a $7 Lyft/Uber ride from the Downtown core. In the case of Bar Olympics especially, I definitely recommend the participants not drive! Although… I bet there will be that one dumbass who hops on a Bird scooter and tries to jet Downtown following the end of Bar Olympics. Yeah we’ll see how well that works out. Heh… those of you who are fans of Beale Street Wine Race know that the Huey’s team practices the wine relay extensively prior to the event. I wonder if they’ll enter Bar Olympics and go to the toy store and buy Hungry Hungry Hippo so they can practice. The Battle of the Birds happens tonight at AutoZone Park! The Memphis Redbirds take on their parent team the St. Louis Cardinals tonight at 7. The gates open early, at 4:15, so you can watch both teams’ batting practice. There’s a very slight chance of rain mid-afternoon but it does not appear to be anything that would affect tonight’s game. I hope this means the building’s owner is putting it up for sale, and not that Court House Deli might close. Just steps out of my front door, Court House is my go-to more than any other for lunch. Whether it’s a mushroom Swiss burger, the loaded red beans & rice, the voodoo wings, or a Greek chicken salad, it’s all good! Hmmm… I really need to eat a salad… then again, I could just ask them to top my read beans & rice with some jalapenos. That’s a green vegetable, right? Also, I’m drinking a green Mountain Dew as I type this as a green-haired troll watches. Seems like that should kind of count for something too. 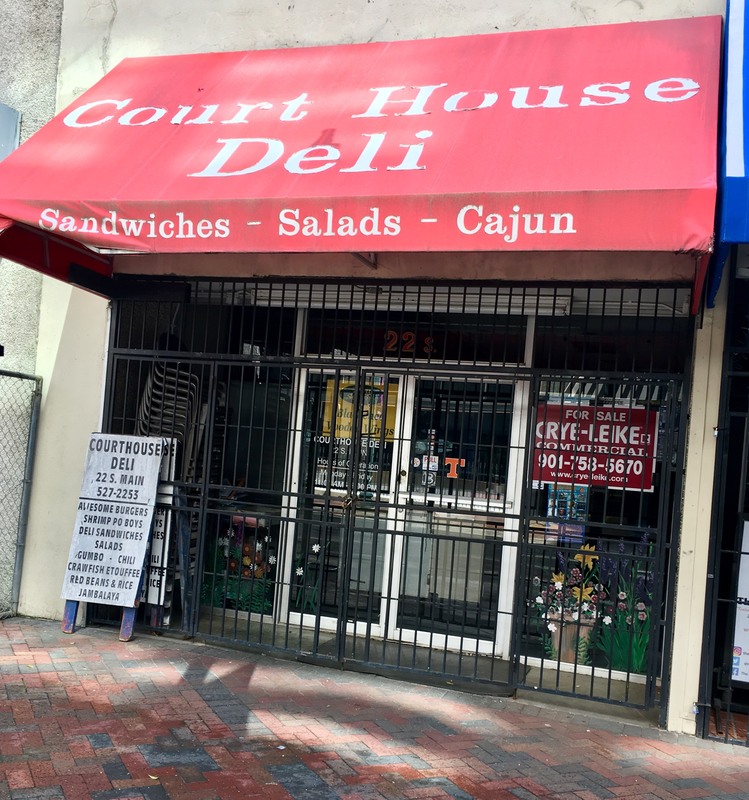 UPDATE 1:44 PM Monday: I just walked over to Court House Deli hoping for a bowl of red beans and rice, fully loaded with cheese, onions, and jalapenos – but the lock is still on the door. I hope Brad and everyone there are OK.
Left Field Properties, a rental company in the Downtown core on Madison, has several positions open: accounts manager, property manager, restaurant manager, and (get ready for this) chess operations and events manager. For that last one, you need thorough knowledge of the game of chess and an interest in operating a successful chess club. Well, that’s a job you don’t see posted every day! Memphis-born Aretha Franklin got her note on Beale Street yesterday. Today would have been Franklin’s 77th birthday. 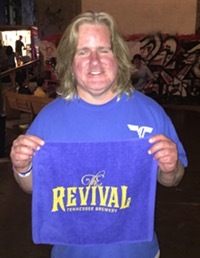 From time to time I blog about events at breweries or Central BBQ locations that are fundraisers for the Wolf River Conservancy. What is the Conservancy, exactly? Keith Cole of the Memphis Flyer has the details. Related to the Conservancy, more than 200 volunteers gathered on Mud Island this past weekend to clean trash out of the Wolf River Harbor. The Memphis Grizzlies’ G-league team (sort of what the Redbirds are to the Cardinals), the Southaven-based Memphis Hustle, have made the G-League Playoffs. They play the Stockton Kings at 9 PM, and the game will be broadcast on Facebook Live. At Wrestling Night at the Grizzlies this past Saturday, Jerry Lawler teamed with Rikishi to beat Buff Bagwell and “Big Poppa Pump” Scott Steiner in a match. What happened later in the game, though, was a bigger deal. Lawler’s late son, Brian Christopher Lawler, used to be part of a dance team with Rikishi and Brian’s Too Cool tag team partner, Scotty 2 Hotty. Saturday night their signature dance was re-enacted, with Grizz playing the part of Scotty and Jerry Lawler playing the part of his son. The Grizzlies are back at FedExForum tonight in their quest to CONVEY THAT PICK, hosting the OKC Thunder at 7. Paulette’s has posted the menu for this week’s Monday night dinner… and next week’s too. Soup or salad, entree, and dessert for $19.99. Johnny Manziel played his first snap as a Memphis Express member last night, but starting quarterback Brandon Silvers stole the show and got the W for the Express (a meaningless W; the Express aren’t going to the postseason). Just as I was disappointed in Memphians who booed the Cincinnati band at the Beale Street parade, I’m disappointed in Memphians who booed Silvers for not being Manziel. It’s not like Silvers put himself in. That’s coach’s call. Congratulations to my friends on Sun’s Out, Buns Out and New Wing Order on their respective 1st and 2nd place finishes in Jalapeno Popper in the 901 Popper Throwdown yesterday. Jesse from New Wing Order: “Guess I have to run jalapeno poppers as a special on the truck from time to time now, huh?” Sounds like a plan to me! Sun’s Out, Buns Out is Glaze’s team. Glaze does the outstanding crawfish boils at Railgarten Thursday evenings and Loflin Yard Saturday afternoons. Check them out if you’re into the ‘bugs! My NCAA bracket is in fair but not great shape, with 43 out of a possible 64 points after the first two rounds. The good news is that 7 of my Elite Eight picks are still in it to win it (Villanova being the one I got wrong) and all of my Final Four teams are in play going into the second weekend. Over the weekend I had someone express interest in purchasing the book I have been mentioning on here lately, The Gaslighting Effect by Reva Steenbergen. It is the definitive manual to understanding and protecting yourself from narcissistic abuse. Steenbergen parted ways with her publisher and the book is temporarily off Amazon, but will soon be back up in paperback and Kindle format. I will post a link when it is back online for purchase. Who sez Betsy DeVos is a do-nothing Secretary of Education? Another really long post finally finished, and I already have two items on deck for tomorrow. I’ll see you in about 24 hours with more news.